The Niokola Koba National Park was really exciting, not just because it was our first real sight of wild animals but because we had the opportunity to play in the mud and get the recovery toys out. We were amazed that no fee was requested at the border and for the first time we decided to use our Carnet de Passage - the car document that is worth more than your life. It was Saturday and the banks were shut but fortunately we had enough CFA to last us through the weekend at the Niokola Koba National Park. At the town of Tambacounda we were approached by a very desperate refugee from Sierra Leone trying to get the money for a taxi to Dakar. It was pitiful to see a man beg so we parted (Andrew willingly, me not -so) with 40 dollars and hope that he was genuine. Camping outside the park was eventful. First there were flies in the dinner then we were all up at 4am preparing ourselves and the tents for the impending storm. In previous countries we have been kept awake by dogs, prayer calls and cockerels. Now it is storms. Oh, for a good nights kip! On the 13th it was Andrews birthday and we had a smashing day game viewing in the park. We saw monkeys, baboons, hippos, gazelles, various types of deer, warthogs and loads of birds. The park had officially closed at the beginning of June because of the rainy season but they let in the odd car if they think you can cope with potentially muddy situations. So far the mud was minimal and Punda delighted in the odd puddle. I had hoped to find a birthday card and a fly swatter for a pressie but this is Africa. Andrew did have one card to open though from his dad. 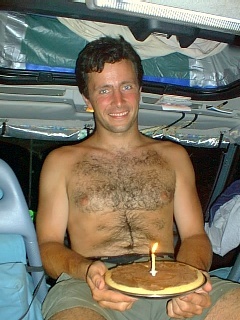 I made a birthday cake in the outback oven - well, more of a pancake! It tasted good though and there was a candle too. I expect the wish was for a cake that rises next time. 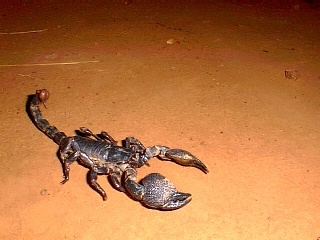 That night we were entertained by a giant scorpion and blue and yellow lizards doing press-ups. The next day we awoke to clouds and we had only been on the track for a little while when the storm hit. The tracks became rivers within minutes and we were forced to sit it out for an hour or so. As the day progressed so did the events. 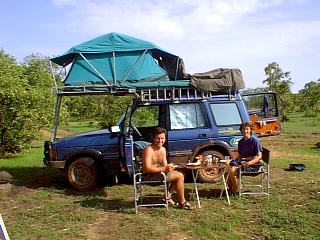 Camel Trophy has nothing on us! 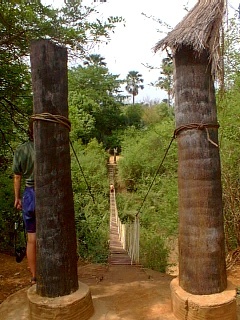 Crossing palm bridges was interesting but by mid afternoon we were up to the chassis in mud - really think jelly welly type stuff. It wasn't long before our shoes were off and we were sliding around with shovels, sand tracks and .....the moment we were waiting for .......the winch. Hurray!!!! Both Punda and Turtle were winched out of some sticky situations and we were filthy. 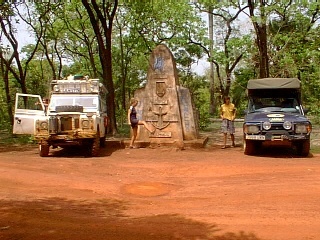 The park is approximately the same size as The Gambia and given that the route ahead was long and of uncertain condition we decided to turn back. If we had continued and had some problems then it is likely that we would still be there. Support teams don't exist out here, even when the park is open. We reached Badi camping point just before nightfall after a few more adventures in the mud and disturbed a hundred baboons who were sleeping in the trees above. What an incredible sight. The speed that the baboons descended the trees and exited was amazing - it was like a wave of baboons. It wasn't long before they were back and kept us awake with their mating calls or the like. We returned to Tamba (passing Chris going towards the park) to visit the bank, market, chawarma bar and to get Noels puncture fixed. 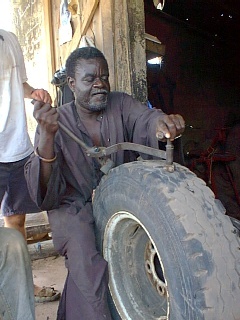 Africans will fix practically any tyre - vulcanising the side wall made very interesting viewing. 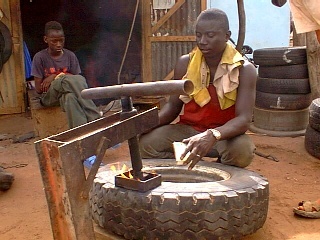 Tyres that we would throw away in England are almost new over here. In the town a couple of donkeys were up to rumpy pumpy in the street. The local children were laughing but the sight brought tears to my eyes and Andrew was very jealous indeed!!!!! 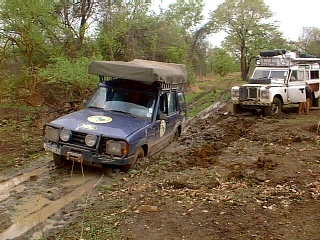 There are three routes into Guinee, two of which are impossible in the rainy season and practically impossible at all other times. We chose the easy (!!!!) route as we had been warned in The Gambia to get into, and through, Guinee before the rains hit hard. The road towards the Guinee border turned to piste and became terrible. 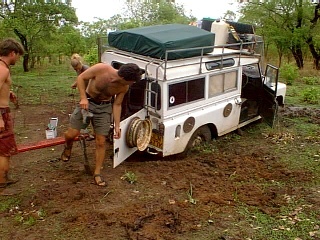 This was pre-rains and now I know what pot holes the size of Land Rovers look like. It wasn't long before I was booted out of the driving seat for incompetent driving. This was the most challenging terrain so far - choose the pot hole, avoid the greenery and pray to Allah that the water isn't too deep. We were though the worst of it after about two hours of white knuckle driving and the gluteus maximus had a chance to get out of spasm mode. The slight (very slight) improvement in the road condition marked the start of Guinee territory. The passage out of Senegal was smooth with the exception of being chased by the Gendarmerie for not stopping at their invisible checkpoint.